If there’s one thing that Etihad Airways has been busy with lately, it is definitely merging partnerships with different airlines. Looking at my E-ticket for my Paris to Abu Dhabi flight, I thought I was in for the usual codeshared flight. Etihad flight number but operated by Air France. See , the aircraft itself is Air France indeed. 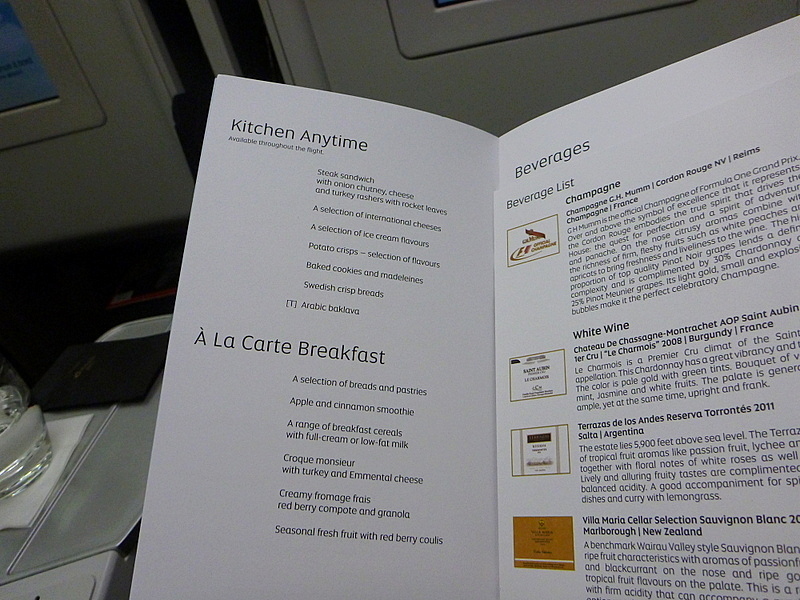 But inside was a mix of 80% Etihad, and 20% Air France. I later learned that this is what is called a “wet-lease” arrangement between Etihad and Air France. 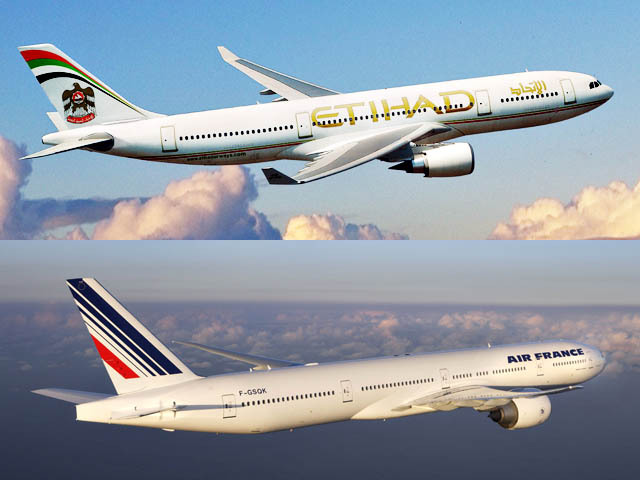 In a nutshell, Etihad leases this Airbus 340 from Air France for the Paris- Abu Dhabi route. 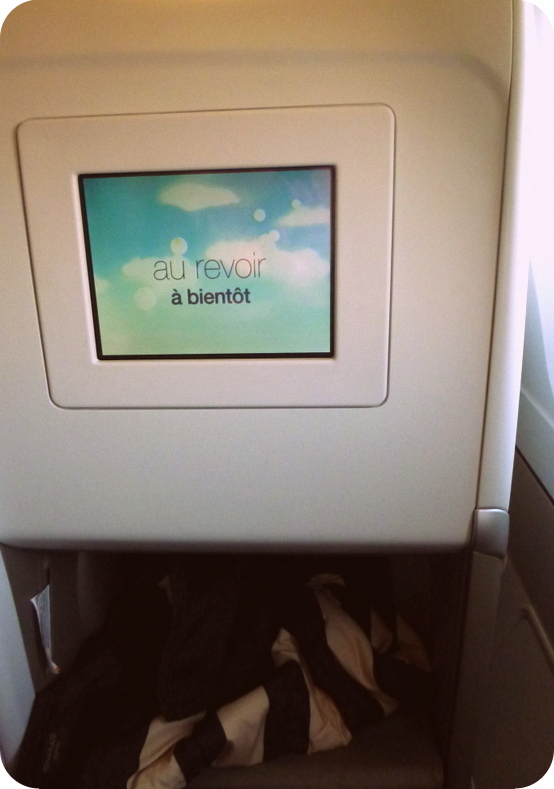 As you can see, the pillows are Etihad, but everything else in this picture is Air France. 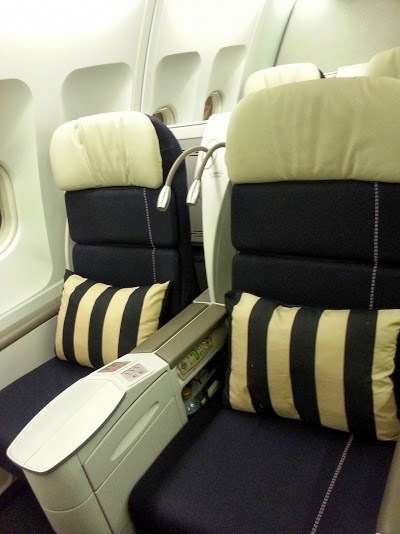 I have to admit that on first glance, the business class seats looked like Premium Economy seats. But it’s a space-smart shell design that is actually very comfortable without occupying too much space. There’s quite a lot of space in the leg compartment for the seat to slide forward to. And at it’s maximum recline, it does not lie flat. The recline is 10 degrees short of being lie-flat. 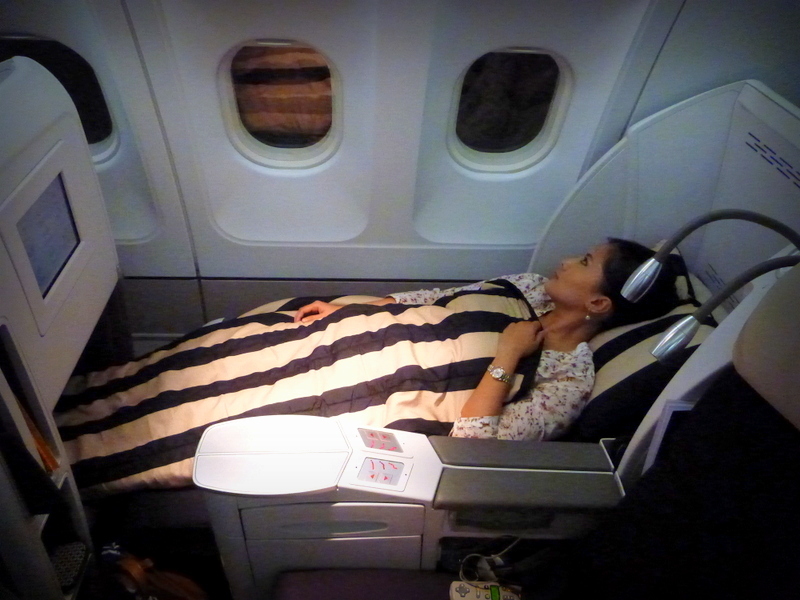 And for a flight less than 8 hours, it is more than comfortable. The screen is smaller than the actual Eithad aircraft business class one. Selection is quite limited (but a lot of European movies), and in general the layout seems very boxy. But it’s very direct and no-nonsense. 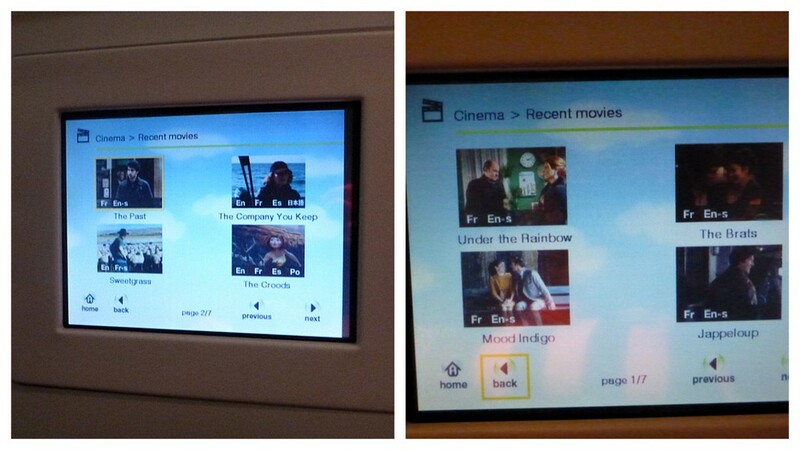 If you are one who gets lost in the world of complicated in-flight entertainment systems, you will love this. 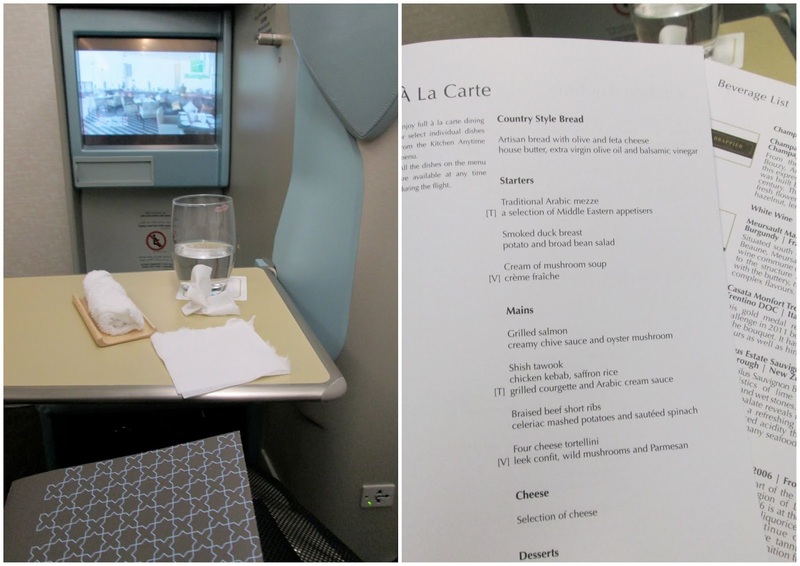 The in-flight meal is provided by Etihad, and for a red-eye flight that left at 10PM, this service offered the “Kitchen Anytime” selection (which is my favourite!) and an a la carte breakfast. I noticed that the wine selection was abit more varied than usual. I already knew what I was going to have even before boarding the aircraft. 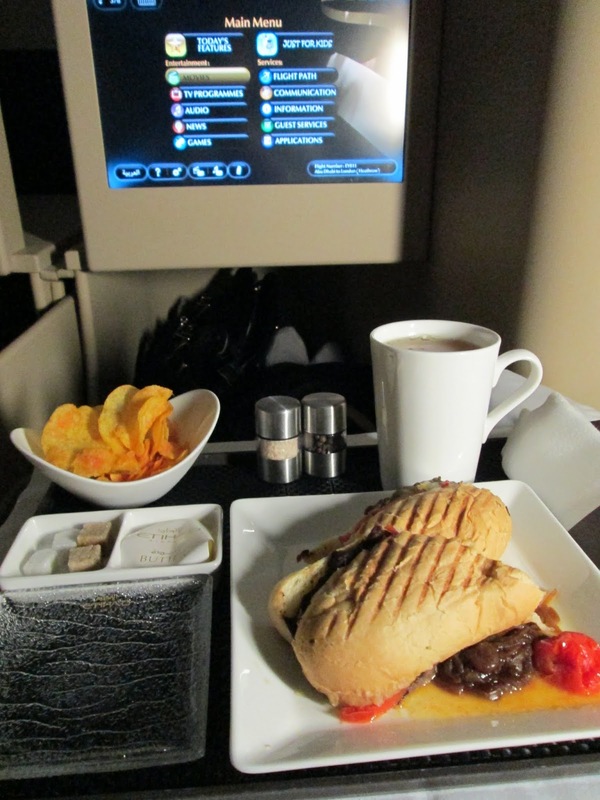 I’m a big fan of Etihad’s Steak Sandwich! All business class flights have them, and every route has their own version of it. The best Steak sandwich for me was the one served from New York – Abu Dhabi. Oozing with cheese and served with potato chips on the side? This is heaven! Take it from me, I’m not a usual fan of beef and I normally have a seafood-based diet but I just can’t resist this steak sandwich. Zombie had lamb (upper right on photo below), a meat which I simply have zero of. 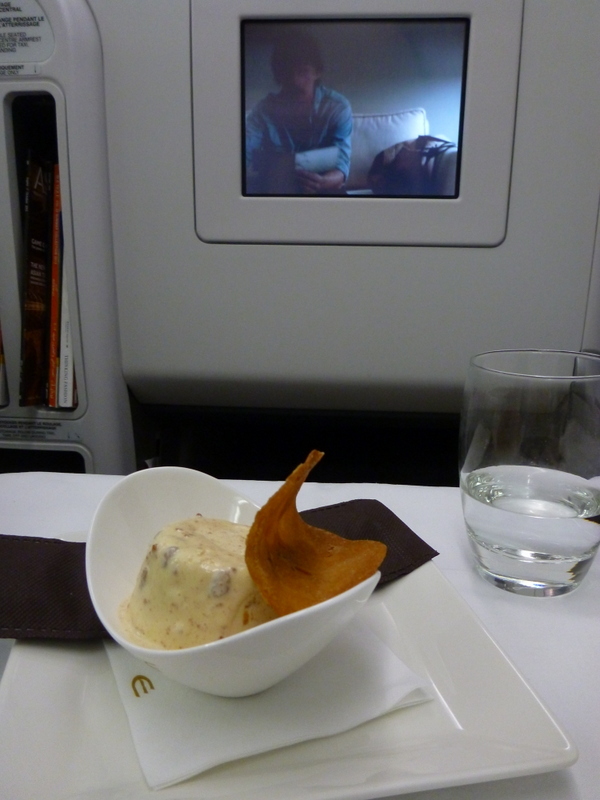 And of course, no flight is complete without ice cream. This was an uber rich caramel flavour. 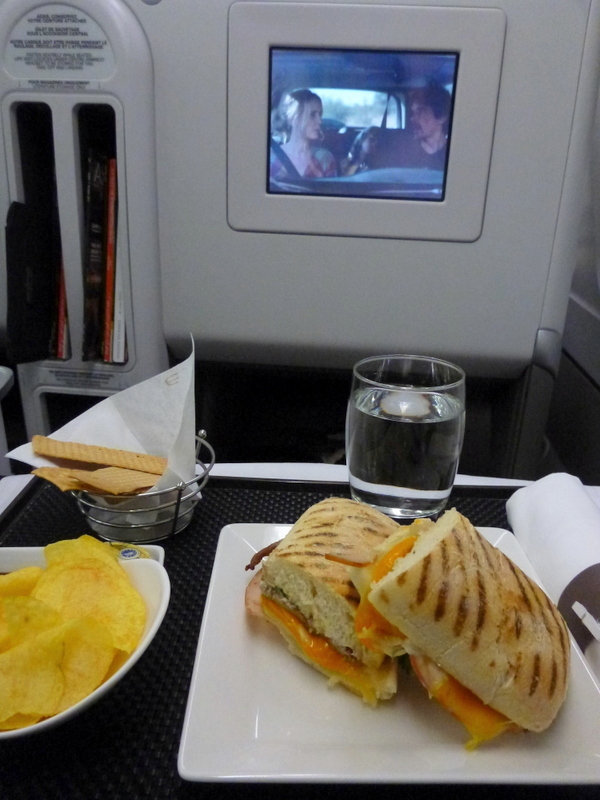 And yes, I do indulge on meals when flying. 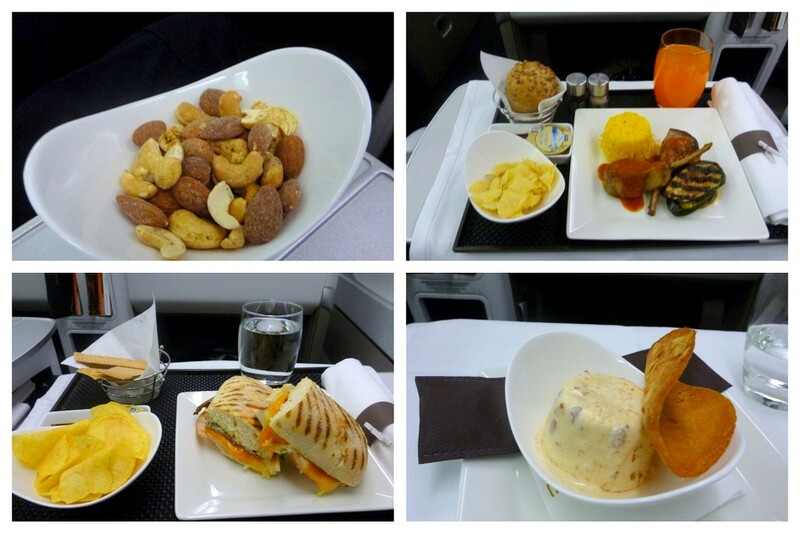 After all, calories don’t count when you are 36,000 feet up in the air. You know that, don’t you? The crew on this flight had a mix of 80% Etihad crew and the other 20 from Air France. All were courteous and professional. Nothing worth hyping or whining about. Now what am I sneering at? 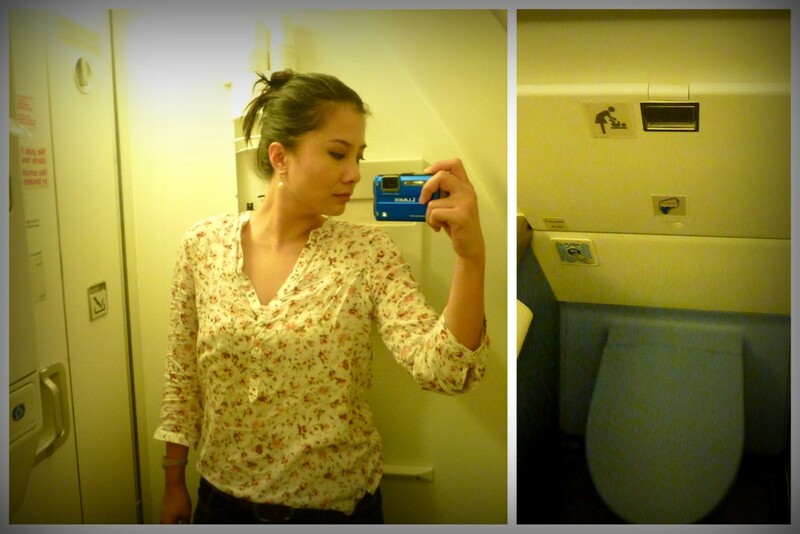 Well I’m just not a fan of business class cabins with economy-sized standard lavatories. When a consumer pays triple or more for a business class fare, they’d want as much extras and justifications to the price tag. While I’m pleased that more and more airlines realise this and some have double-sized lavatories for business class, some are still in need of catching up. 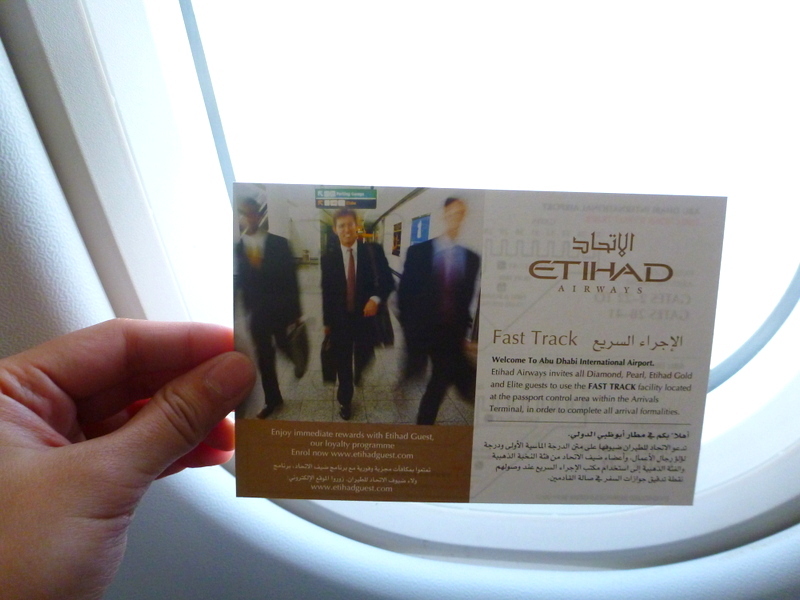 As with all Etihad business/ first class flights, we were given the fast track card to enable a much quicker exit time out of the airport. We didn’t use this as we were only transiting in Abu Dhabi. However, the Fast Track card is only of use to certain airports. If exiting in Abu Dhabi, this certainly helps you to speed along immigration and customs. I find however that in London Heathrow, it wasn’t much of a help as there are a whole lot of passengers also carrying a fast track card (from other airlines). Nevertheless it’s still another good perk to have. While Etihad has been aggressively making deals with numerous airlines in the name of expansion, I am interested to know how these ‘wet-lease’ type of codeshares will fare out in the long term in regards to passenger satisfaction. Hi Irene, definitely 🙂 flight time passes by quickly when you’re having fun!